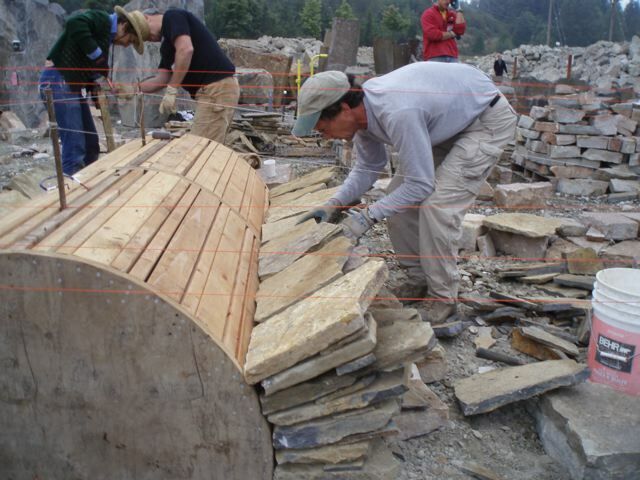 These are a few of the more than 300 photographs that were taken at the stone masonry class on building a dry stone bridge during the four day Stonefest 2008 held at the Marenakos Rock Center in Preston, Washington. 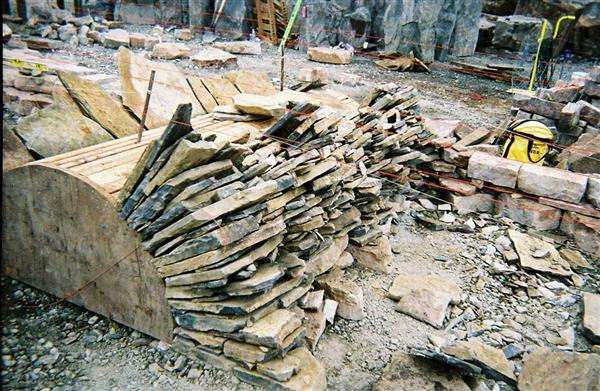 Dry stone construction does not use cement or mortar to hold the construction together. Dry stone walls rely solely upon differing sizes of stone, which are correctly placed, to prevent the wall from falling down. 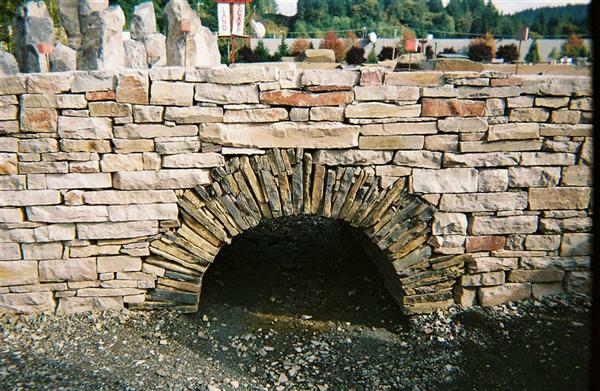 This dry stone bridge is held together by the proper selection and placement of the stones and by the action of gravity. 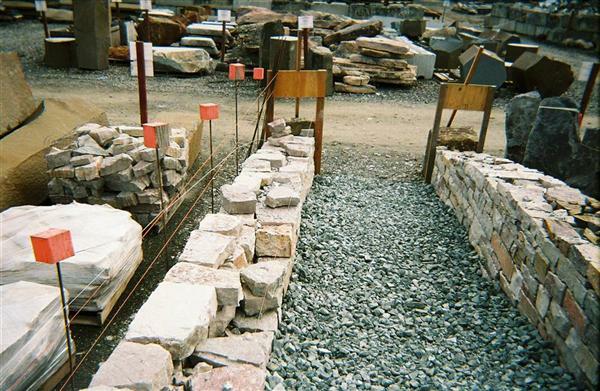 By carefully selecting and the placing the stones together properly, the action of gravity pulls down on the stones and the friction between the stones holds them in place. 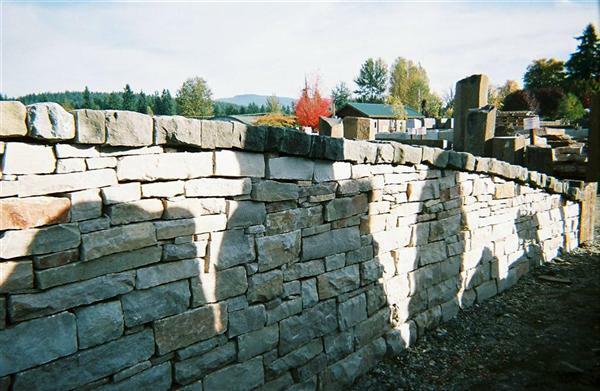 Unlike double faced mortared walls that are built vertically, a dry stone wall is usually built in the form of an apex. This is called the slope or batter. This slope helps to disperse the wall's weight evenly toward the ground, ensuring that any movement of the stones in the wall, is forced towards the center of the wall rather than outward. Therefore each wall face leans toward and is supported by the other. The walls of this dry stone bridge were built with no batter or slope. This is because the stones were placed in such a manner that the force of gravity pulled down evenly on each stone. The two separate faces of each wall are tied together and supported by the put through stones and the cobble stoned walkway between each stone wall of the bridge. To build the wall, each stone is carefully selected for it's position in the wall. Each stone is placed over two other stones in such a way to insure a stable match. 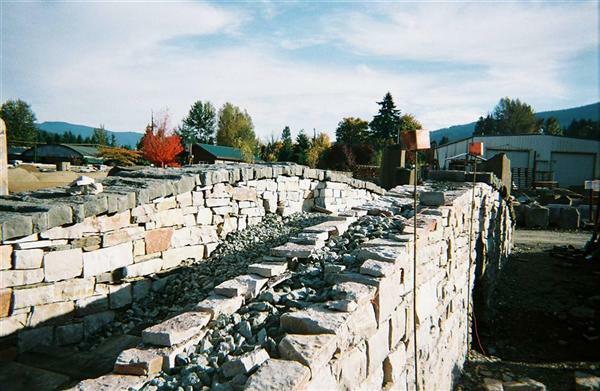 As each stone is placed on the wall, it's position is also strengthened from behind with pieces of rubble stone called wedges or pinning-stones. These small wedged shaped pieces of stone are pushed tightly under the gaps at the back of each of the stones that face the outside of the wall. This process is continued for the entire wall length. Because random natural stones are unstable, even when placed on a flat surface, they will wobble. Strategically placed stone wedges will stop any movement like this from happening. 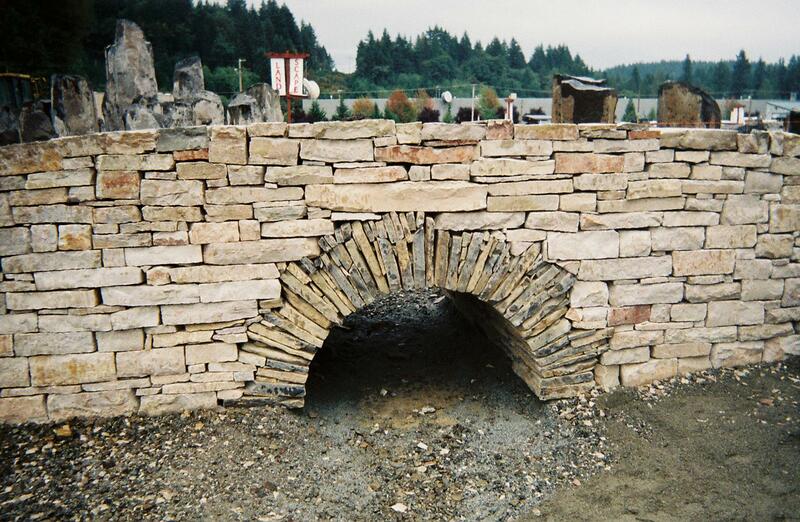 For construction costs of recreating this dry stone bridge, Click Here. Many more pictures and a construction text will follow. This photo shows the side view of the Northern side of the nearly finished bridge. 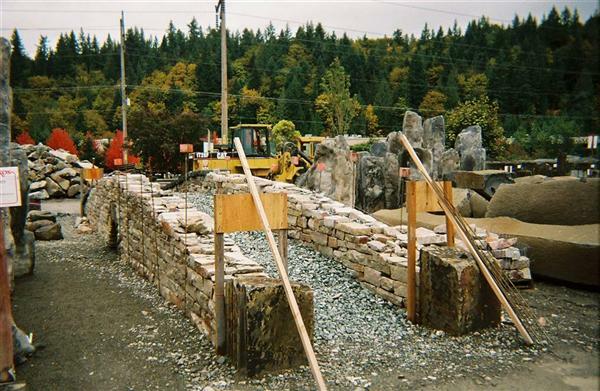 This wall is nearly complete with the Tenino sandstone coping stones covering most of the tops of the bridge walls. 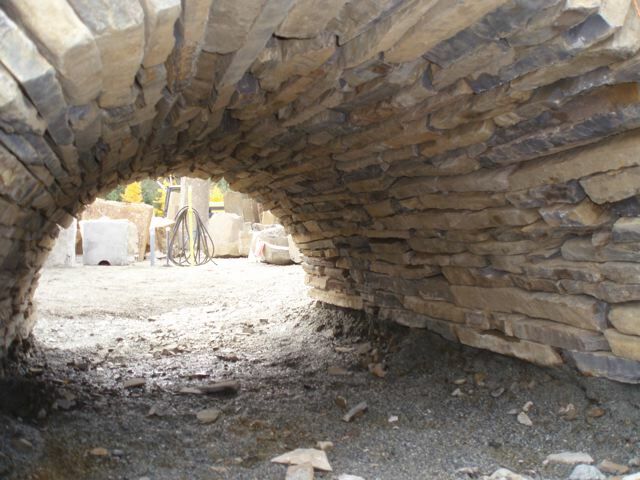 This photo taken from the Eastern entry shows the details of the completed dry stone bridge. NOTE: The Montana Slate end blocks and the Montana Slate first step stone. And the manner in which the cobble stones are arranged in the bridge walkway. 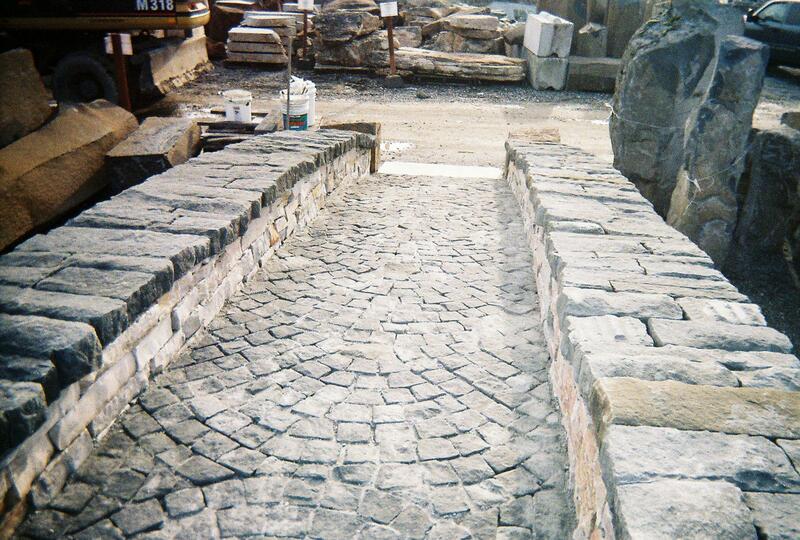 This photo shows more details of the cobble stone walkway of the completed bridge. Photo was taken near the top of the bridge looking toward the Eastern entrance. NOTE: The coping stones atop the bridge walls, and details of the cobble stone arrangement. For a detailed view of the coble stone arrangements, please Click Here. This photo shows the end view of the finished bridge. 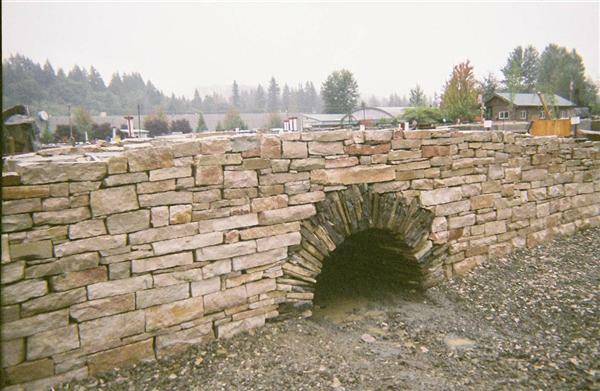 The bridge is complete with the Tenino sandstone coping stones covering the top of the bridge walls, and the Tenino sandstone cobble stones covering the top of the bridge walkway. NOTE: To view more detailed photographs of the patterns for the coble stones, and pictures of the finished bridge, please Click Here. 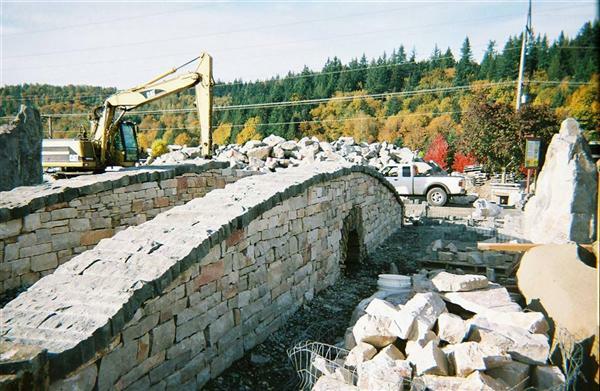 This photo shows the Eastern entrance to the dry stone bridge, with most of the Tenino sandstone coping stones in place atop the bridge walls. The large square Montana Slate stones at the ends of each stone wall, measure 23" square and stand 28 " tall. 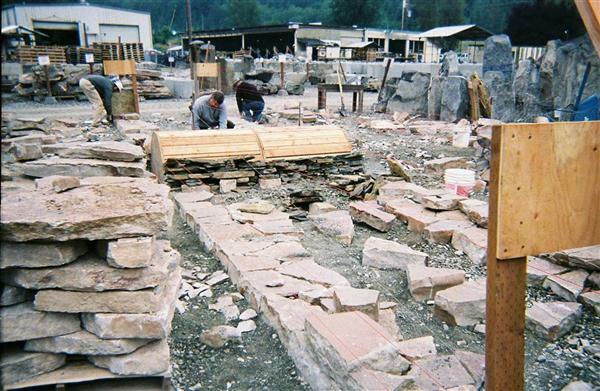 Each Montana Slate stone is placed into the soil about 2 inches deep. 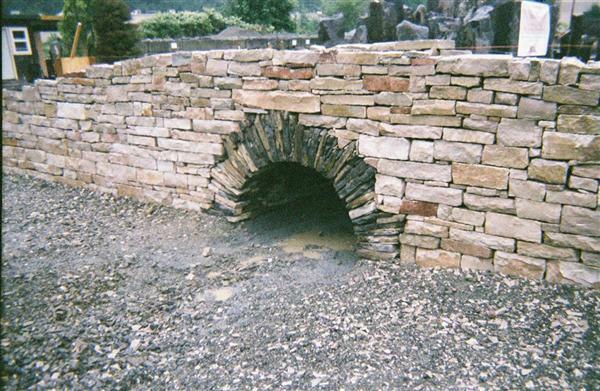 This photo shows the Eastern entrance to the dry stone bridge, before the linestone walls were finished. NOTE: The wooden structures at the ends of the bridge are called Batter-Frames and they hold up the mason's string to guide the wall stone placement. This photo shows the Southern wall and the Arch. Note how the voussoir stones had been properly put into place to form the bridge Arch. This photo shows the bridge Southern wall during a light drizzel. 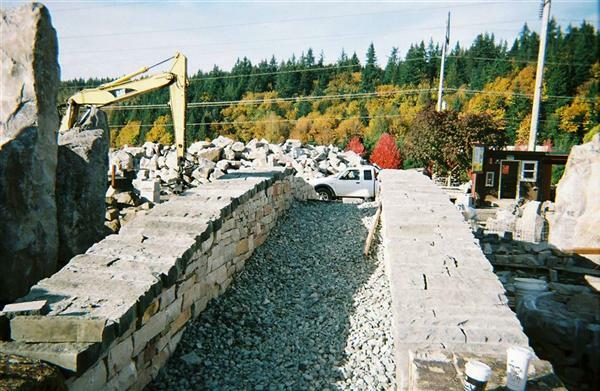 This picture was taken before the Tenino sandstone coping stones were put into place. This photo shows clearly the voussoir stones and their placement in the wall and the Arch in the Southern wall of the bridge. This photo shows the ends of the voussoir stones inside of the Bridge Arch after the Arch forms were removed. NOTE: No Springer stones were used in this bridge Arch. This photo shows the Bridge with the Arch barrel forms removed. 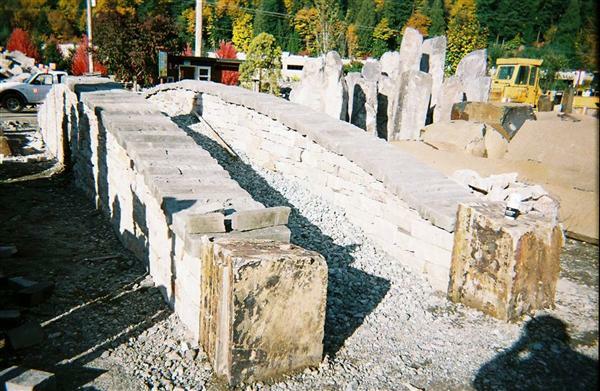 The bridge wall is now ready for the coping stones to be placed on the top of the bridge wall. 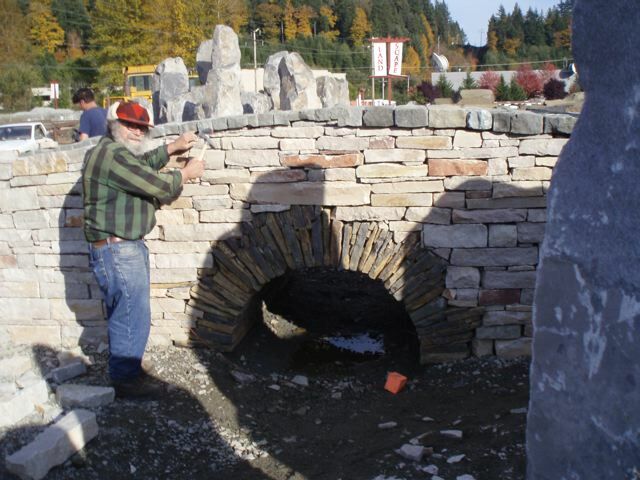 This photo shows Patrick McAfee, one of our two stone masonry instructors, laying the first voussoir stone properly in place next to the bridge arch form to begin forming the Bridge Arch. NOTE: How the red string is used to align the voussoir stone properly to the center of the bridge Arch. 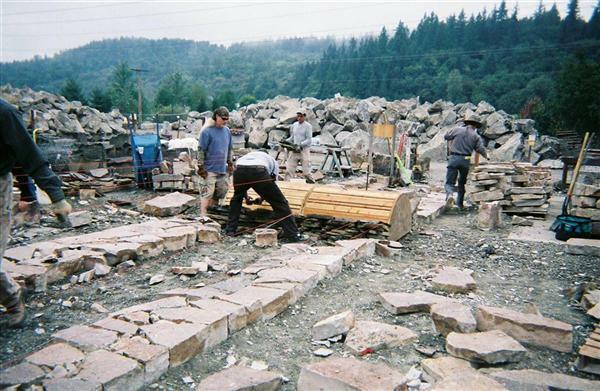 This photo shows the voussoir stones being put ito place to form the bridge Arch. Note the red string that one end tied to the center of the halve circle of the bridge Arch form. This red string is used to make sure that each voussoir stone is aligned nearly perfectly with the center of each of the concentric arches that form the bridge tunnel. 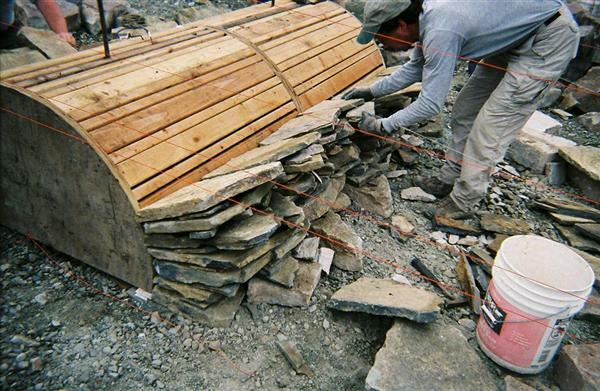 This photo shows more of the voussoir stones being put ito place to form the bridge Arch. 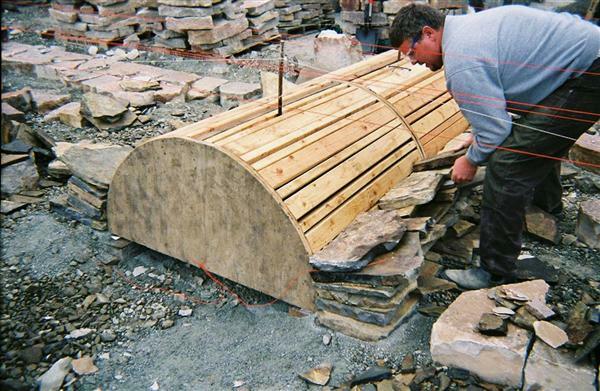 This photo shows the workman placing more of the voussoir stones in place. This photo shows more of the voussoir stones in place. NOTE: the red string that is used to help line up the voussoir stones to the center of the bridge Arch. This photo shows more construction in progress. NOTE: The wooden structures at the ends of the bridge are called Batter-Frames and they hold up the mason's string to guide the wall stone placement. This photo shows more bridge construction in progress. 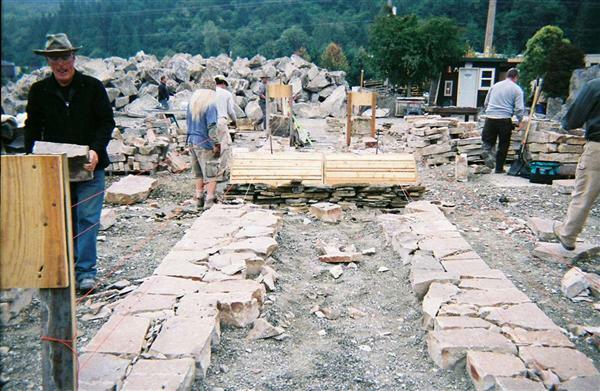 This photo shows the foundation of the dry stone bridge and the start of building the Arch for the dry stone bridge. NOTE: The rubble stones are used to fill the space between the stones that face the outside of each wall. 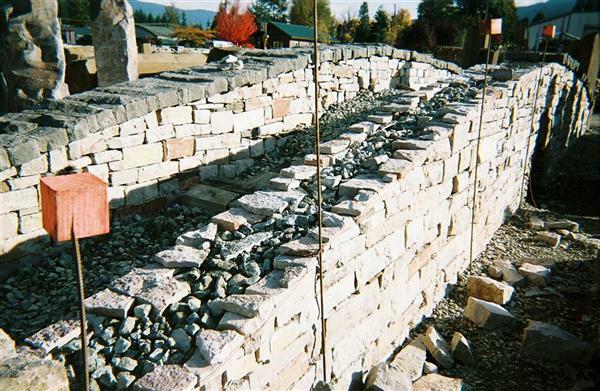 Rubble stones are used rather than sand or dirt because water must drain through the inside of the wall to prevent any collected water from freezing. Freezing may force the wall stones apart. 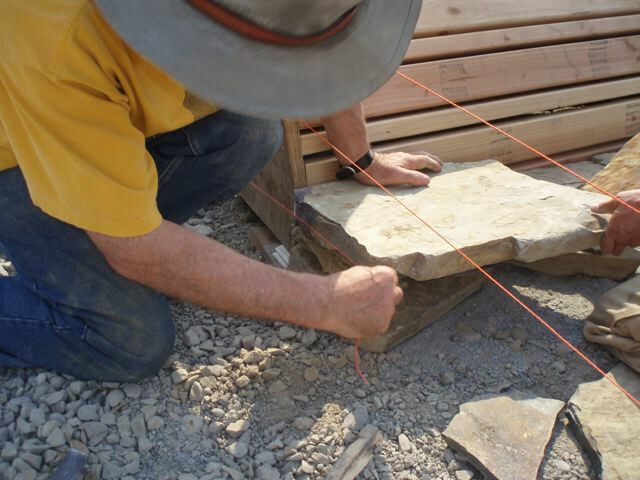 This photo shows the workman placing the voussoir stones in place. Bridge Foundation underlayment of 5/8 minus stone beneath the first layer of stone wall foundation stones. 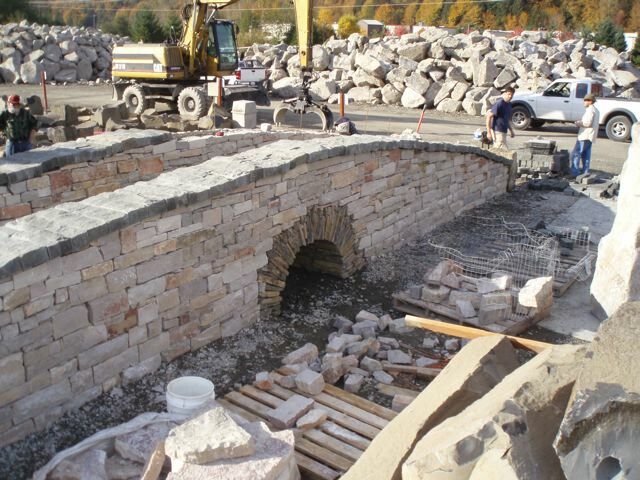 This photo shows the placement of the limestone stones of the bridge walls nearly finished. And the laying down of crushed rock for the cobble stone pavement base. 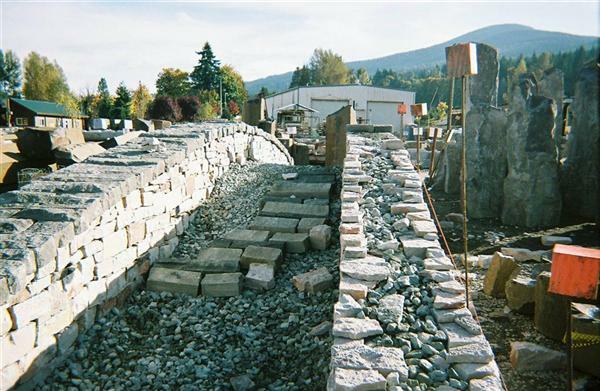 This photo shows the nearly finished bridge with most of the coping stones in place. 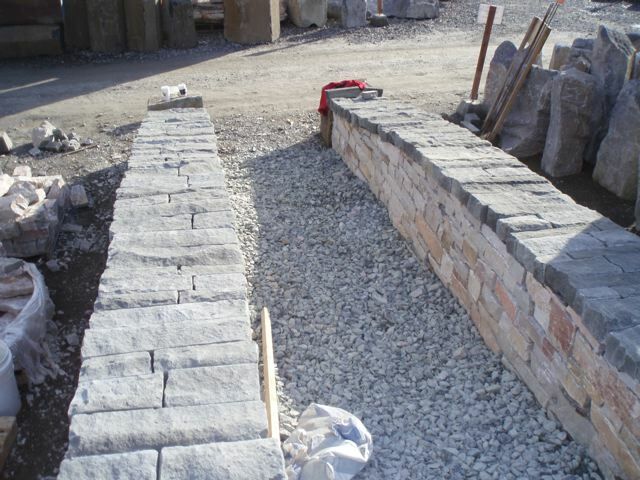 This photo shows the nearly finished bridge with most of the coping stones in place. 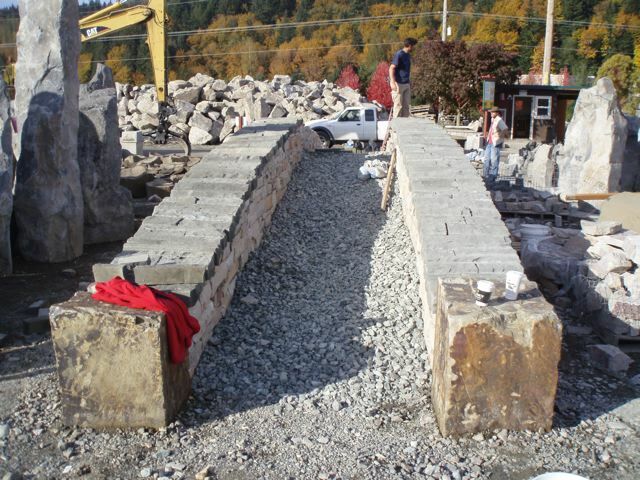 The bridge is almost ready for the installation of the Tenino cobble stone procedure to begin. This photo shows the nearly finished bridge with the coping stones in place. 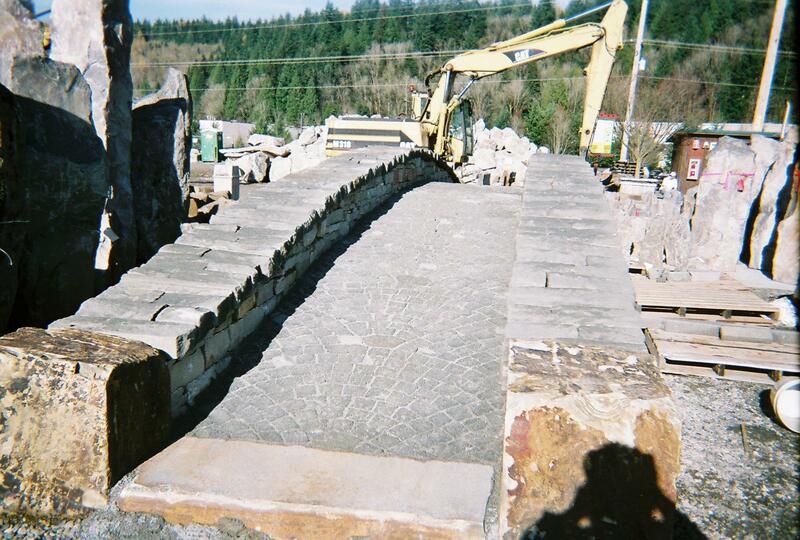 The bridge is now ready for the installation of the Tenino cobble stone procedure to begin. 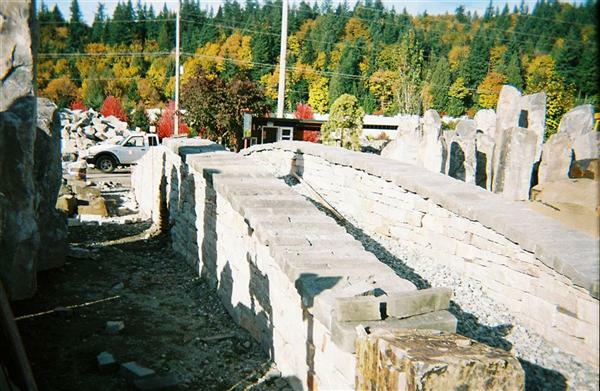 This photo shows the Tenino sandstone coping stones in place in the Eastern halve of the Southern wall. 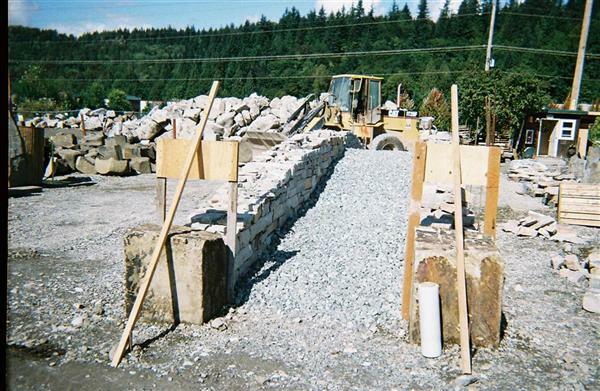 This photo shows the Northern wall finished with the Tenino sandstone coping stones in place and the Southern limestone wall almost ready for the Tenino sandstone capping stones to be placed into position. This photo shows the Southern limestone wall nearly finished and almost ready for the sandstone coping stones to be placed into position. This photo shows the Northern wall finished and the Southern limestone wall nearly finished and almost ready for the sandstone coping stones to be placed into position. Note the upright pieces of rebar and the red string tied to each one. This red string is used to guide the placement of the uppermost linestones so that the finished wall has the proper curve. 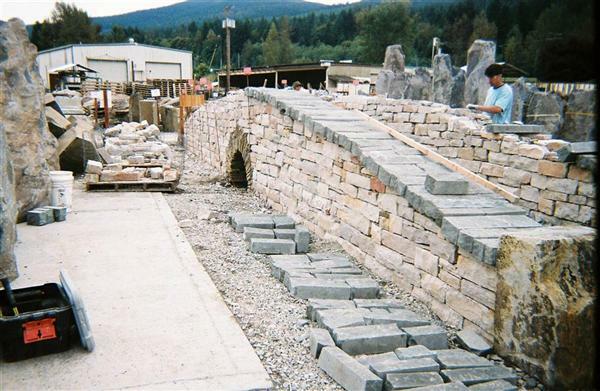 This photo shows both walls of the dry stone bridge finished, and the crushed stones in place for the base for the Cobble stones that are to placed in the walkway. View is looking East from the top of the Bridge toward the Bridge entrance. This photo shows the the Eastern entrance to the bridge before the sandstone capping stones were put into place. NOTE: The upright pieces of rebar and the red string tied to each one. This red string is used to guide the placement of the uppermost linestones so that the finished wall has the proper curve. This photo shows the Northern wall of the bridge. 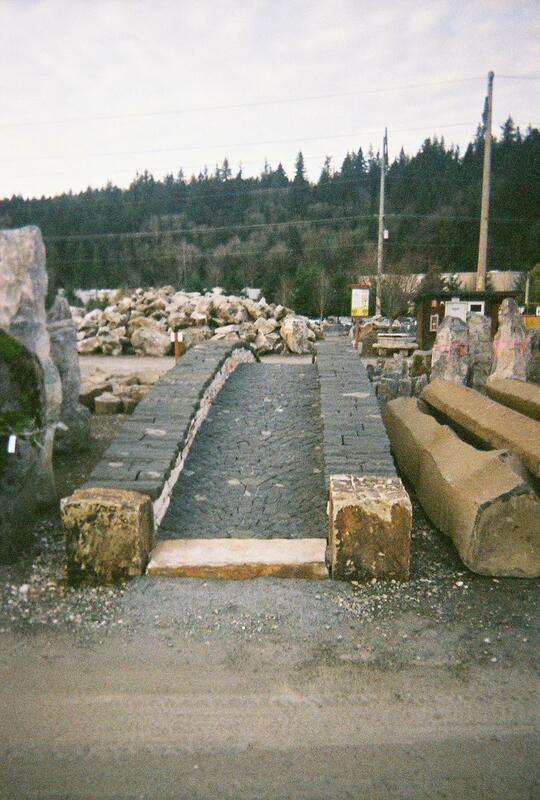 The dark Tenino sandstone coping stones measure as follows. 4, 5, or 6 inches wide. Thank you for dropping in at the Pacific Mountain Masonry, a stone masonry and construction contractor's supply, a L�beck Haus store. 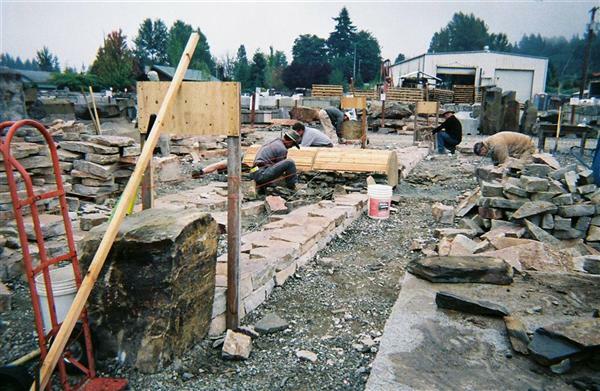 Masonry equipment, stone masonry tools, stone masonry links and information, articles, masonry and timberframing construction books, and information on masonry and timber construction. A great selection of masonry hammers, chisels and chisel sets made by Trow and Holden Company. Visit the L�beck Haus Bookstore Bookstore Directory. Construction, contracting and building books. Including timberframing and masonry books. And more than one hundred other categories of non-fiction, how-to books, horticulture, engineering, textbooks, scientific and technical books. L�beck Haus Bookstore also has a large selection of home improvement books.